Israeli army neutralizing cross-border terror tunnels from southern Lebanon into Israel, following discovery earlier this month. 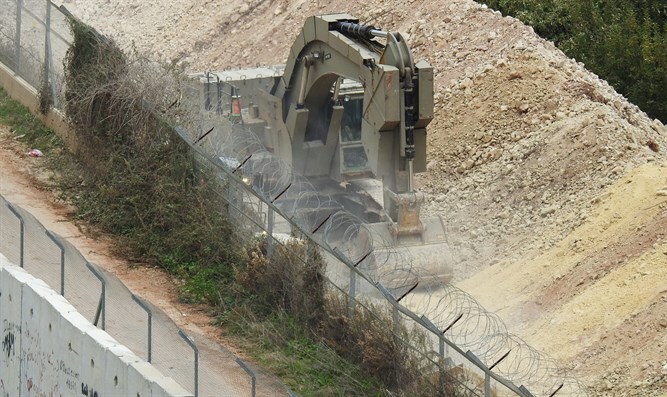 Israeli security forces began demolishing four cross-border tunnels Thursday along the Israeli-Lebanese frontier, as part of the ongoing Operation Northern Shield. Earlier this month, the IDF launched Operation Northern Shield to locate and neutralize terror tunnels built from southern Lebanon into Israeli territory by the Lebanese-based terrorist organization Hezbollah. Since the beginning of the operation, four such tunnels have been discovered. According to a report Thursday by Channel 2 News, Israeli forces are using alternative methods to demolish the tunnels, without the need for explosives. Earlier on Thursday, Prime Minister Binyamin Netanyahu hinted at “developments” in Operation Northern Shield, during his meeting with leaders from Greece and Cyprus. On Wednesday, Prime Minister Netanyahu spoke at a press conference ahead of the United Nations Security Council meeting on the Hezbollah terror tunnels, and urged the UN monitoring force in southern Lebanon, UNIFIL, to take action against the tunnels. Later on Wednesday, the IDF revealed details regarding the fourth tunnel discovered along the border.